When the Brotherhood reforms under a new vampire leader, Martin searches for Mister to help avenge the destruction of New Eden. Now aligned with a pack of berserker vampires led by a she-vamp known as The Mother, the Brotherhood cult lays waste to New Eden. Having spent a decade building a peaceful life for his new family, Martin watches helplessly as Mother murders his wife Peggy and their young daughter Belle. Desperate to take revenge against Mother, Martin heads south toward the stake lands in search of Mister. Martin takes shelter with farmers Karl and Jean Armstrong. The couple drugs Martin and tries to kill him for food. In their struggle, Karl accidentally shoots Jean while Martin puts a meat cleaver into Karl’s head. After getting a tip on Mister’s whereabouts, Martin ends up captured and forced to fight for sport in front of savage spectators. Martin’s undefeated opponent is ‘The Stakelander,’ who turns out to be Mister. During their battle, Mister finally realizes who Martin is and the fight suddenly stops. The ringmaster demands that Mister and Martin fight to the death. Mister throws a spear that kills the ringmaster. Mister releases a vampire to distract the crowd while he rescues a feral captive called Lady and escapes with Martin. Martin, Mister, and Lady hole up in a house. The Brotherhood attacks. Martin and Lady escape outside through a hidden hatch, but Mister is captured. The Brotherhood hangs Mister on a cross and leaves him for vampires to kill at night. Mister is able to get free and fight back. Mister is severely injured when a vamp claw catches in his lung, but Martin and Lady come to his rescue. Mother later kills a Brotherhood member for allowing Mister to escape. A trio of Brotherhood members attacks Martin, Mister, and Lady while they camp. Mister and Martin kill two of them and take Juda, a young and seemingly disillusioned cultist, captive. The group comes across Bat, an old acquaintance of Mister’s, who escorts everyone to a fortified encampment. Doc Earl treats Mister’s wound. Juda is jailed. Juda feigns committing suicide in his cell. Billie, the young woman tasked with bringing Juda his meals, unlocks the cell door and Juda kills her to make his escape. Mother and the Brotherhood attack the base with their vampires. The camp successfully fights them off and recaptures Juda. While interrogating Juda, Mister confesses that he shot an arrow into Mother’s eye back when she was a regular vampire mothering an infant. Mother baited Martin by killing his family so that Martin would lead her to Mister. Martin slits Juda’s throat. Mother and the Brotherhood attack the base again. A suicide bomber takes out the camp’s two generators. Martin and Mister battle Mother. Martin finishes their fight by decapitating Mother. Bat and Earl intentionally blow themselves up to take out a vampire horde. Martin and Mister escape with vampires in pursuit. On the road, they reunite with Lady and discover she has been turned into a vampire. However, Lady saves the men by killing an attacking creature. Mortally wounded in the fight, Mister puts a stake into Lady’s heart to finish her off. Mister tells Martin he doesn’t have the spirit to fight anymore. He urges Martin to continue running while he stays behind to hold off an approaching vampire horde. Mister begins fighting the attacking creatures. In the light of day, Martin joins another band of nomad survivors trekking across the countryside. Martin and Peggy’s ‘happily ever after’ ending at the conclusion of “Stake Land” lasted long enough to produce a darling daughter named Belle. It did not however, outlast an onslaught from a rebuilt Brotherhood and their band of berserkers led by a powerful she-vampire known as The Mother. Mother’s coven of fanged freaks and cloaked fanatics mercilessly laid waste to the Canadian safe haven of New Eden. Mother made the attack personal by targeting Martin’s newfound family for painful extermination. Now Martin wants revenge. And he knows exactly the right man to help him. Martin returns south through the savagery of the ‘stake lands’ in search of Mister. The journey is even more perilous solo than it was when he was Mister’s protégé, and it doesn’t get any easier once he finds who he is looking for. Reunited with the fabled vampire hunter who made him a man, Martin and Mister discover their wasteland world is deadlier than ever. Given the ways they both have changed, the two men must rediscover each other if they are to continue to adapt and survive. A lot of lightning was caught in “Stake Land’s” bottle in 2010. Virtually every element was some take on a trope, from the premise of vampires mixed into an apocalyptic aftermath to protagonists featuring a gritty nomad mentoring a forced-to-grow-fast teen. Yet the indie filmmaking spirit present in each sincere subtlety of direction, design, acting, and narrative combined for an immersive dystopian fantasy embedding huge hooks in spite of conventions employed. 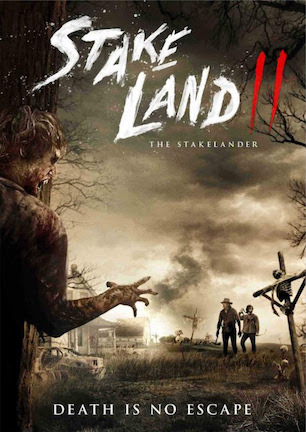 “Stake Land II,” previously known as just “The Stakelander” for a nickname Mister earns in the movie, reunites a fair chunk of the first film’s principle people. Peter Phok and Larry Fessenden are back on board as producers. The three actors who survived “Stake Land” also reprise their roles, with lead Nick Damici contributing the screenplay once again. What’s missing this time around is Jim Mickle’s creative input as co-writer and director, with latter duties now stewarded by the duo of Dan Berk and Robert Olsen. Through elimination, it stands to reason Mickle’s addition to the collective vision is the absent ingredient keeping the sequel from summoning the same scope of magic. Because “Stake Land II” is fine for a follow-up, but it doesn’t have the resounding punch of its predecessor. “Stake Land” (review here) was no stranger to formulaic scenarios, though the briskness with which it bounded from beat to beat while details helped distract put fresh skin on its fiction. “Stake Land 2” is similarly episodic in structure, except its setups are scraped from a really dry well. Martin is taken in by a cagey couple eager to serve him soup in a bowl given its own close-up. Martin wonders aloud why he is the only one eating. Do you think his meal might be… drugged? A nervous Brotherhood lieutenant is forced to report his mission failure directly to Mother. Will she spare him with mercy or put her fist through his chest for not carrying out her command? A small camp’s jailor who brings prisoners food is a sweet, gullible girl. The lone inmate insists what they say about him isn’t true. He pleads with her for freedom, promising he won’t cause trouble at all. Is he playing possum? Will she fall for his ruse? Predictability isn’t the problem. It’s the way plot points are staged, as though viewers are too dim to remember callbacks on their own. It’s enough that camp leader Bat makes a clear point about his twin generators’ importance while giving Martin a tour. We’ll get it when they are blown up later. We don’t need a 12-second dolly into a close-up of the machinery after characters have already left the shot. Outside of all this obviousness, it’s enjoyable to take another trip into the “Stake Land” setting. Connor Paolo’s transformation into an older, wiser, vengeful Martin is a compelling arc for his once one-note character. Mister regressing in the other direction as sympathetic tendencies erode his ruthlessness works just as well. Their dynamic was the original’s core. In moments when their character evolution is at the fore, that is when the sequel works best. It could be my perception because “Stake Land II” debuted on SyFy. But where the first film felt cinematic in style, this one seems small screen in presentation. That doesn’t necessarily equal docked points. There’s just a tempo that is tied into keeping accessible action arriving at on cue intervals, never lingering long on more introspective moments if they aren’t helping maintain the TV tone. It was always likely that living up to “Stake Land” would be a losing proposition. “Stake Land” had serendipitous stars aligning and the timing of its release hit the right window for horror fans. Add a few years and the landscape is different for this kind of film. Without co-creator Jim Mickle at the wheel, “Stake Land II” was destined to sail in choppy waters no matter what. All things considered, commitment from cast and crew comes through to make the sequel worth a watch. Everyone is still playing it straight on both sides of the lens, keeping campiness mostly in check. Dead worlds are rarely this vibrant. Characters, even clichéd ones, are still colorful. Too much routine ensures the second spin can’t scratch the same itch as the first. Yet for anyone fascinated to see the difference ten story years makes for Mister, Martin, and the stake lands, “Stake Land II” is a suitable successor good for 90 minutes of melodramatic horror entertainment. January 18, 2017 by Ian Sedensky.